Overall, the price of materials inputs to residential construction declined 1.8% in December (not seasonally adjusted) according to the latest Producer Price Index (PPI) released by the Bureau of Labor Statistics (BLS). While most building materials prices showed little movement in December, prices paid for OSB fell by double digits for the second consecutive month. OSB prices declined 12.0% (NSA) in December after falling 13.7% in November. 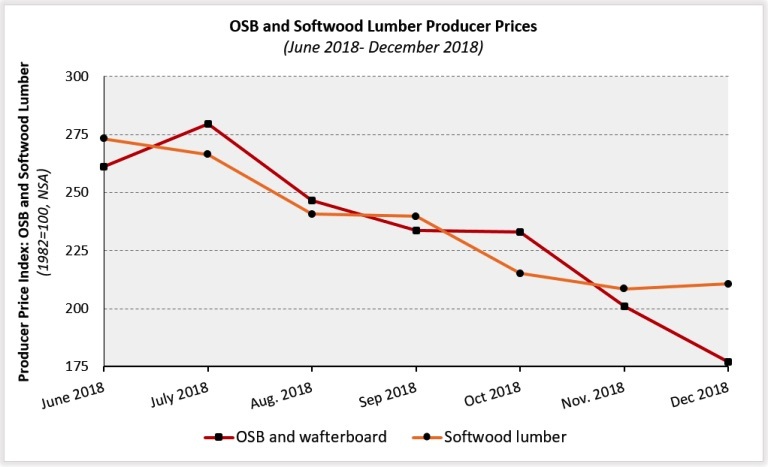 Prices paid for OSB decreased 22.4% in 2018 and have fallen 36.7% since hitting their most recent peak. Although softwood lumber prices rose by 1.0% (NSA), the increase followed five consecutive monthly declines totaling 23.6%. The path of prices since June 2018 has been similar to that of OSB, according to BLS. Read more at NAHB’s Eye on Housing blog.